Syracuse guard Tyus Battle drives. Mandatory Photo Credit: Kicia Sears, The Juice Online. BRAD BIERMAN (Season Record: 3-1): Has there ever been a tougher stretch of the last seven games of the ACC regular season since Syracuse joined in 2013-14? Actually, last year was just about the same on paper, as the Orange finished with five of the same seven opponents they’ll meet between Wednesday night’s matchup at N.C. State (8:00 p.m. ET / ACC Network) and the finale at Clemson March 9, with all but Top 25 teams Virginia and Louisville new this year. As with last season, it seemingly took a first-ever ACC Tournament win (Wake Forest) to propel the ’Cuse to being selected as the last team to Dance, so again there is minimal movement for error beginning with this Wolfpack road test while looking to improve on a 4-1 league record away from the Dome. 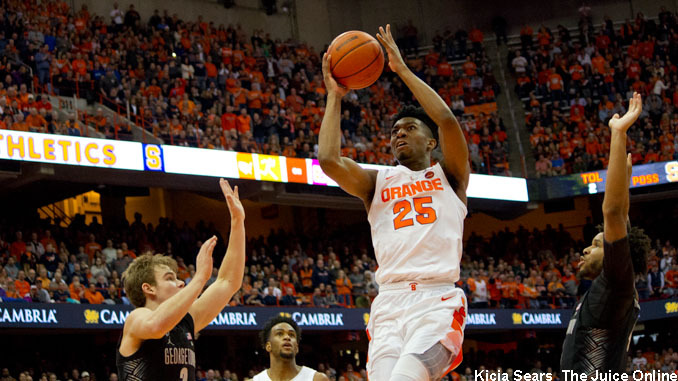 Syracuse has now developed its own version of “Killer B’s” with Tyus Battle. Buddy Boeheim and Oshae Brissett combining for 49 of Syracuse’s 67 points in the B.C. win last weekend, and as usual that will be a key component for the Orange. With Brissett, Battle and Elijah Hughes often driving to at least get foul shot opportunities, the need to get Boeheim and others open looks is tantamount with such little inside prescience. N.C. State comes off a 79-76 road win at Pittsburgh last Saturday after leading by double-digits much of the second half, but has struggled for consistency all season. Not to mention the modern, all-time low point embarrassment of 24 total points (nine made baskets) against Virginia Tech Feb. 2 in a 47-24 head-scratcher. Syracuse is 3-1 all-time at PNC Arena against the Wolfpack, and we see an overtime game looming following a late NCSU tip in with seconds left in regulation, before Battle and the Orange gut out a crucial 82-78 road victory over State. SAUGAT SEN (Season Record: 0-2): The Wolfpack were on a three-game losing streak before eking out a win against Pittsburgh, a team that is now 2-9 in conference. To be fair, the Wolfpack faced No. 3 Virginia, No. 12 Virginia Tech and No. 8 North Carolina during that skid. NC State comes in at ranked No. 35 in the NCAA NET rankings while Syracuse is 48. This is a critical Q1 away game for the Orange to keep their NCAA tournament hopes alive. NC State made headline news after scoring only 24 points against Virginia Tech, a modern era record for fewest point scored by a ranked team. While the Wolfpack may not be that offensively challenged against the Orange, they are also likely not to put up huge offensive numbers with the Orange ranked 24th in the country in adjusted defense according to KenPom.com. The key factor will be their 3-point shooting, which is fourth best in the conference. The matchup between Braxton Beverly versus Frank Howard will be one to watch. The 6-foot sophomore guard for the Wolfpack has been shooting 64 percent from behind the arc the last two games, scoring 17 points against both Pitt and UNC. He has attempted, and made, more 3-point shots than anyone else on the NC State roster. The Syracuse guards will want to keep a hot shooter like him in check. The key will be whether Howard can earn more playing time with better offense so he can stay in the game to guard the perimeter on defense. Even with his struggles, Howard has led the Orange with 1.6 steals per game. If he can deliver offensively, and more importantly, defensively, I expect Syracuse to pull out a 72-68 win.